Encryption is a performance inspired by the issues surrounding illegal surveillance, data mining and human relationship to technology. With the increasing capacity for gathering and manipulating data there is no limitation for what kind of representation of persons and events that can be created and for what purpose. This opens up a divide between the representation of the world and actual reality. The performance seeks to generate a room within this ambivalent landscape, where the line between what is real and not has become blurred. It is an attempt to bodily and visually explore the space between contradictory forces; a place where reality loses its integrity and is transformed, without us fully recognizing how or why it matters. Encryption is a collaborative project between two artists from different disciplines. 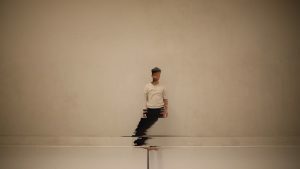 Tony Tran is a choreographer and performer based in Oslo. His work is created in collaboration with other artists and explores universal and collective themes of power, identity and memory. Andreas Daugstad Leonardsen is a filmmaker and visual artist based in Trondheim. His practice ranges from experimental super 8 films to metaphysical documentaries. His work has received awards at national and international film festivals, including an honorary mention for Best Short Film at The Norwegian Short Film Festival, 2016. Performer: Tony Tran. Dramaturge: Ingri Fiksdal, Thomas Schaupp.